NO MATTER WHAT YOUR CHILD'S GOALS AND INTERESTS ARE, YOU CAN FIND A GREAT FIT IN ONE OF OUR UNIQUE AND COMPETITIVE OPTIONAL PROGRAMS. Choose from 40+ themed elementary, middle and high school programs across Shelby County! 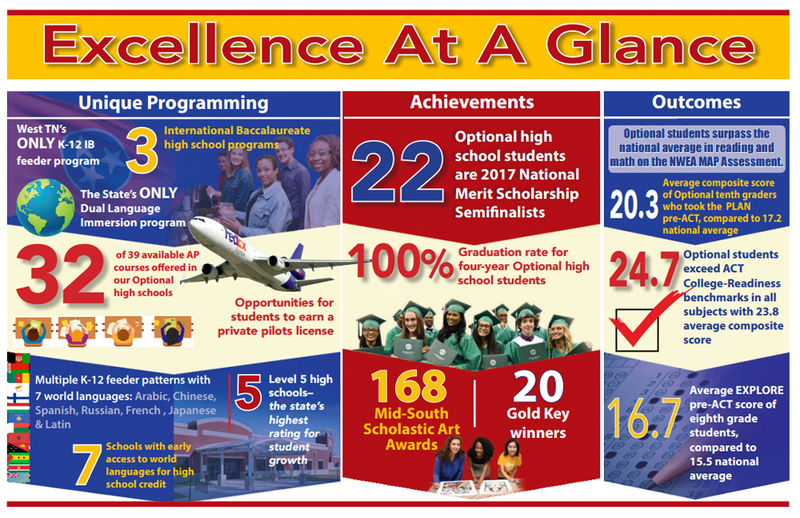 The Optional Program has a longstanding legacy of excellence in Shelby County. Free of tuition, our schools provide creative and rigorous coursework and extra-curricular programs led by teachers who inspire and challenge high-performing students to achieve their best. Each of our schools has a specialized learning focus, such as Enriched Academics, College Prep, International Studies, International Baccalaureate (IB), Creative & Performing Arts, Health Science, Automotive Technology and more. Entrance requirements vary by school program. 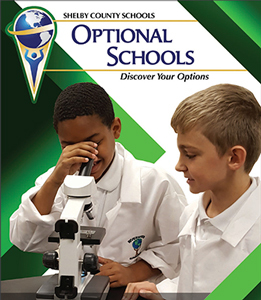 We invite you to learn more by calling or visiting any of our Optional schools, or contacting the Optional Schools Department at (901) 416-5338.